As soon as you arrive to the Port of Filicudi, the place where the mooring is situated, you can immediately admire the wild fashion of the island. 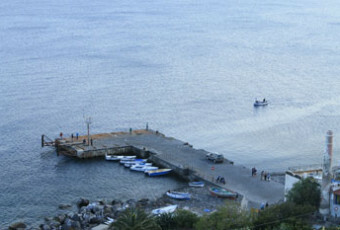 Our tour to discover the hidden beauties of Filicudi Island starts from the Port of Filicudi, situated on the south-eastern side, corresponding to the namesake plain. Certainly, this one is not the most amazing zone of the island, but it constitutes the neuralgic centre of all its economic activities, and the place where all the services of touristic support are situated. On the coastal stretch, near to the pier, it is possible to visit and to enjoy the beauty of a beach, big enough to relax and to fully enjoy the crystalline sea which caresses the foreshore. Going along the suitable for vehicles streets, which from the port connect all the villages, we reach Mount Guardia, one of the most fashionable zones of Filicudi, a unique point where you can observe evocative landscapes of the “six sisters” and of the Sicilian coast. North of Mount Guardia, a crossroads leads to Rocca di Ciauli, a little village where small typical island’s houses are situated along a steep slope, surrounded by bushes of bougainvillea, jasmine, and hibiscus. Now, going along the suitable for vehicles street again, in northerly direction, in a few minutes you arrive to Liscio village, situated under the slopes of Mount Terrione. From this point you can admire a wonderful landscape, raising upon the promontory of Capo Graziano and other islands, except Alicudi, covered with Fossa delle Felci. Once this village was inhabited by the richest Filicudians, and the refined houses constitute the evidence of that fact. From Liscio village we proceed in northern direction towards Valdichiesa, named after the twentieth century church of Saint Stefano still existing. 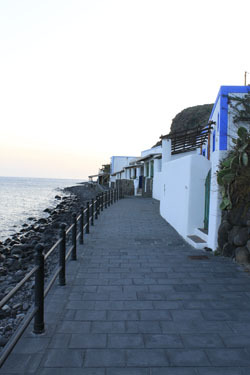 The houses making part of this village have the same characteristics typical of the Aeolian agrarian villages. From the square of Valdichiesa, in nearly 40 minutes, it is possible to go through a path leading to Mount Palmieri; the village, because of logistic difficulties impeding its restoration, is still intact with its traditional houses decorated with colonnade and wide terraces. 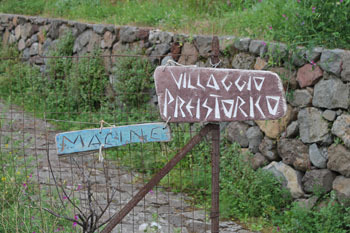 Behind Valdichiesa, on the slopes of Fossa delle Felci, there is Serro village, where few houses form a little but characteristic agricultural settlement. Our next tour is to discover the ghost village of Zucco Grande, of Vallone Fontanella and Case Ficcarisi. The path, of the length of around 2km, forks from Valdichiesa in the north-eastern direction, to lead then to Zucco Grande, an ancient prehistoric village, by this time forsaken since about a hundred years because of a strong migration movement, and wild nature which overwhelmed it. Once this zone had about 300 inhabitants and, according to some archaeological findings, was also a favourite zone of the Greek populations which settled there. From Zucco Grande a small path leads to Vallone Fontanella, called so because of a small spring of water, collocated in a cave which creates a very evocative landscape glimpse; here it is possible to refresh yourselves after long walks. From Zucco Grande village another mule track forks and allows you to reach Case Ficcarisi where to admire a luxuriant vegetation mostly compound of heather bushes, rockroses, strawberry trees, and wild roses. This locality is named after the once existed small settlement. Moving some steps you arrive to the panoramic point, where you can admire the complex of islands surmounted by La Canna and Montenassari, and by gullies of Filo del Branco. Besides, in Ficcarisi, if you are lucky, you can observe the colony of Eleonora’s Falcon, wonderful birds which dominate the gullies of Filo del Branco. 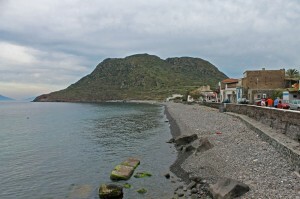 Once having explored the eastern side of the island, we now move towards the south-western side of Filicudi, to discover Montagnola, Pecorini and Stimpagnato. From Piana del Porto, the only suitable for vehicles street quickly leads to Pecorini. It is possible to reach the church dating back to the 17th century, and the house-museum of Jaques Basler, where we can admire an ancient millstone made of stone, and numerous tools. From Upper Pecorini it is possible to admire the view of the little fishermen village of marine Pecorini, where a very busy beach covered with pebbles is situated. This is the favourite place for the sailors, who during the high season, stop to taste the aperitif enjoying the non-stop nightlife. From marine Pecorini, in few minutes, a mule track leads to Stimpagnato and, after having crossed a typical village, you arrive through a staircase made of lava stone, to Montagnola.